Jon Cone, who for years has been producing the Piezography BW fine-art black-and-white ink sets for Epson printers, this week announced a set of replacement inks for Epson’s Stylus Pro 4800, 7800 and 9800 printers, along with refillable cartridges for the ink. According to Jon, ConeColor inks have been formulated to match the UltraChrome K3 ink set used in those printers, letting you can use the inks with Epson’s existing ICC profiles, while still saving significantly over Epson’s ink pricing. 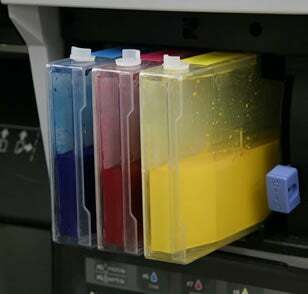 A 1-liter bottle of ink is $184, which means that ConeColor’s 18.4 cents per milliliter cost is considerably less than Epson’s 50.9 cents per milliliter pricing for its 220ml non-replaceable cartridges (Epson’s ink cost is 63.6 cents per milliliter for the smaller 110ml cartridges). Cone’s new refillable 220ml cartridges, which are made of clear plastic, are available in a set of eight for $390 (see below). Given Jon’s history, I have no doubt that these inks are high quality, although I would imagine that anyone printing at this level would want to create their own ICC profiles for the papers that they’re using, regardless of how close in fidelity the inks are to Epson’s originals. Note, too, that these inks will not work with the most recent Epson Stylus Pro printers that use the Vivid Magenta inks, the Stylus Pro 4880, 7880, 9880 and 11880. It would also be good to see Wilhelm Research (or similar) data confirming that prints made from ConeColor have archival life comparable to the UltraChrome K3 inks (click here for Wilhelm’s report on the Stylus Pro 4800). Jon says that he is using nearly identical pigment technology to that of Epson, and that the print longevity should be comparable.